Sh. Geeta Ram (Tabla Player). Our Music Association has brought credit to the college by bringing prizes in classical instrumental, Orchestra, Bhajan, Solo Dance, Group Dance, Group Song & Qawwali etc. from time to time. Students also participate in Music Contests at College, Zonal, University and All India Level. 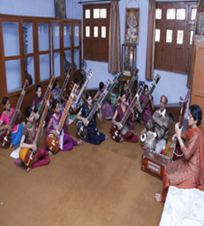 Music is a regular subject of this college and it also helps the students to develop their talent and hobby. Talent show, the first cultural activity of the session, is organized every year by the department. A large number of students enthusiastically participate in song, dance, poem, speech, painting, mono acting, quiz, playing instruments etc.